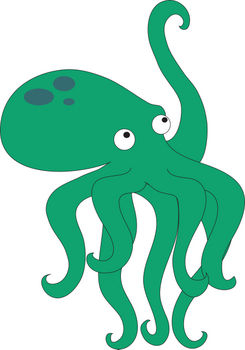 Description: This free stock clipart illustration of is of a green skinned, baby octopus, reaching up. This cute little guy was created by Rosie Piter for Acclaim Images. The octopus in this clip art image can be purchased in a larger size, or a new custom illustration can be made for you by calling customer service at Acclaim Images 541-618-8723.